I asked the question over four years ago. Since then, I’ve had a few bites, but now I’m going to take the Full Corn Plunge. If you like spicy things, I’d recommend hot sauce and pepper (my favourite). More common is butter and salt, though I’ve also heard brown sugar can be tasty. Butter salt and pepper is the traditional Southern way, and my preference. Dash of hot sauce is also good. I didn’t realise who responded before me. A true Southerner. Listen to Yuriko. Probably the best way to deal with grit, at least in my culinary experience, is to put it far back on the shelf in your cupboard and then throw it out once the boll weevils get to it. So good luck in your endeavors, eh? 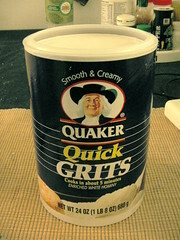 and ask there; you’ll get all the grits advice you need.